Well, John Wayne, yes, of course. But Dean Martin? Ricky Nelson? Who’d be able to make this work at all, let alone make it memorable? Director Howard Hawks, that’s who. Rio Bravo’s initial commercial success and the enduring respect in which it is held are usually credited principally to Hawks, with considerable justification. Hawks was one of the great directors of his long era, from silent movies to the 1970s, and he didn’t work in westerns all that often. 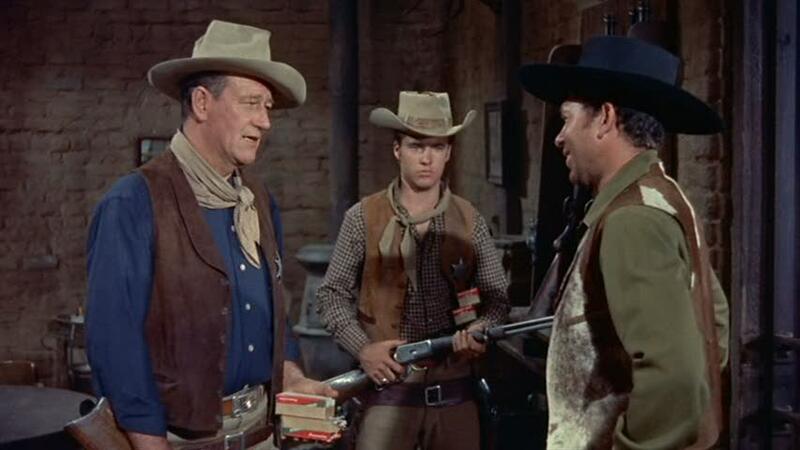 Rio Bravo was a commercial sort of movie, not held in great critical regard at the time of its release in 1959. But that respect has increased over the ensuing 50 years, and it still scores high in re-watchability. Various of the elements of the casting and film shouldn’t work, but they do. The title apparently comes from the fact that Mexicans refer to the Rio Grande as the Rio Bravo. The central plot is fairly common. Sheriff John T. Chance (Wayne) of Presidio County, Texas, is holding the local land baron’s brother in his jail on a murder charge, and faces insuperable odds in trying to keep him there until a U.S. marshal arrives to take custody of the miscreant. Tension builds as Chance puts together his beleaguered team, strategy develops on both sides and the odds against Chance rise. Subplots involve the rehabilitation of his alcoholic deputy Dude (Martin) and an unlikely romance between Chance and young gambler/dance hall girl Feathers (Angie Dickinson). This was a first film for Martin and Nelson, and very early in Dickinson’s career. Wayne was in the stage of his career (after The Searchers) where his characters became frankly middle-aged. Martin and Nelson were both better known as singers than actors, and for commercial purposes (and presumably to show male bonding), there had to be a scene where song breaks out. It’s the cheesiest moment in the movie, but surprisingly it doesn’t undercut the development of the film. Martin is excellent, as he was in another, later western (The Sons of Katie Elder). Nelson didn’t have much of a film career, but he was fine in this as youthful gunfighter Colorado Ryan. Dickinson was remarkable as the young gambler Feathers in a May-December romance with Chance. And there are lots of small touches that work well in retrospect: The way Wayne’s character favors a rifle (as he did in Hondo and several other movies) as his weapon of choice, and how he handles it. Martin’s sloppy attire and convincing degradation when his character is a drunk. The use of roll-your-own cigarettes throughout the movie, as an indication of male bonding. Wayne’s convincingly battered hat, which he used from 1939’s Stagecoach for the next 20 years of movies (see, for example, She Wore a Yellow Ribbon and Hondo), tilted forward on his head with the front brim bent slightly up. A few touches don’t work as well: The singing scene is not universally beloved. And the stock-Mexican portrayals of the hotel keeper and his wife don’t play as well today as they may have 50 years ago. But the movie is remarkably sure-footed, and what seems to be a leisurely plot development seldom drags. 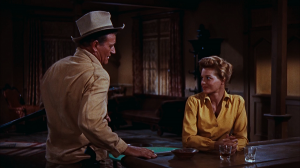 Hawks said that one of the interests for him in making Rio Bravo was to make a counter-statement to Fred Zinneman’s High Noon, released six years earlier and nominated for a Best Picture Oscar. Instead of trying to get help from townspeople and cattle drovers (as does Marshal Will Kane in High Noon), Chance here prefers to rely instead on a very small group of professionals for his support. Hawks was also not impressed with the drawn-out slow-motion violence of Peckinpah’s influential The Wild Bunch a decade later; he thought that violence was more effective if it was over quickly as in real life, instead of glorifying it in extended slower sequences. Hawks was known for stealing from himself, re-using material that had worked in his other films. The Chance-Feathers relationship is very reminiscent of the middle-aged Bogart and young Lauren Bacall in Hawks’ To Have and Have Not (1944). Even some of Feathers’ lines are virtually the same, and she shows a very similar aggressiveness in the relationship. Walter Brennan was also a principal supporting character in To Have and Have Not. There are similar pop musical touches in both movies, with Hoagy Carmichael in To Have and Have Not and Martin/Nelson in Rio Bravo. 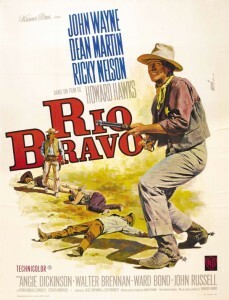 Later, Hawks would remake Rio Bravo twice more, with diminishing success each time. 1966’s El Dorado featured Wayne again, with Robert Mitchum in the Martin role and a young James Caan in the Nelson role. It worked, but not as well as Rio Bravo. 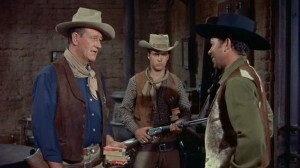 Rio Lobo in 1970, again starring Wayne, used many of the same plot elements. It was Hawks’ last film and not one of his more successful in a number of ways. John Carpenter took the plot as the basis for his 1976 urban action film Assault on Precinct 16. Some credit for the enduring success of Rio Bravo should go to excellent screen-writing by two frequent Hawks collaborators: Jules Furthman (a screenwriter since 1915, with Mutiny on the Bounty, To Have and Have Not, The Big Sleep, The Outlaw, Nighmare Alley) and Leigh Brackett (The Big Sleep, Hatari, El Dorado, Rio Lobo, The Empire Strikes Back). As with most great films, however, a number of elements worked together well to produce something worth remembering. This entry was posted in 55 Greatest Westerns and tagged Howard Hawks, John Wayne, Lawman and Community, Town Taming, Walter Brennan, Ward Bond on September 11, 2013 by Nicholas Chennault. Watched it again after many years. My God, Angie Dickinson is gorgeous and she steals every scene with Wayne. 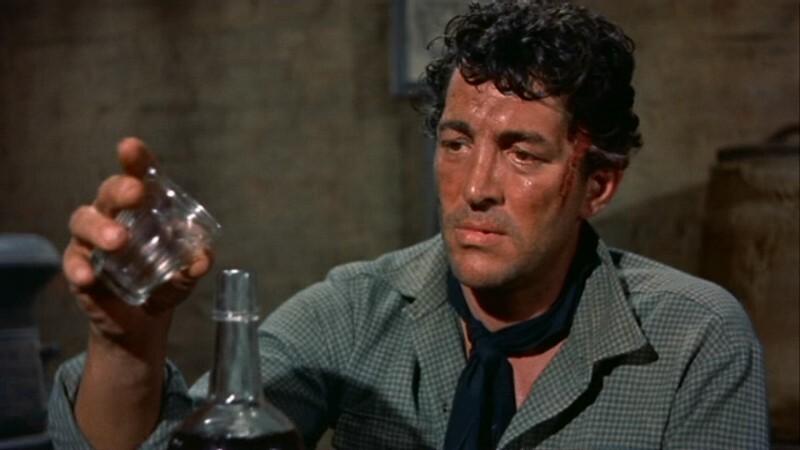 Dean Martin turns in a fantastic performance. Relative to his Rat Pack and solo career, he’s doing nothing short of Shakespeare, and he pulls it off.